If your home's foundation is sinking, you'll notice lots of warning signs such as wall cracks, leaning chimney, sticking windows and doors, stair step cracks, and sloping floors. Also, look into your basement for signs of water damage such as gaps under support beams and basement wall leaks. 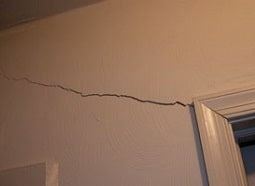 To prevent further foundation problems and costly repairs, hire a foundation repair professional. At Jerry's Waterproofing, we offer heavy-duty steel piers for settling homes in the Omaha area. Our supportive piers will restore your foundation back to normal, so you can be comfortable in your own home. 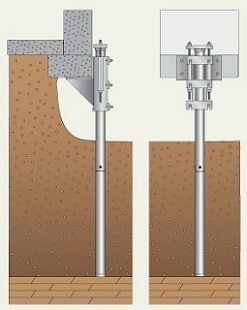 What are steel push piers? Push piers are strong galvanized steel tubes that are hydraulically driven into the soil until they reach the more suitable soil. The installation process is quick, yet effective. Excavation: A small hole is dug into the foundation to uncover the footer. After the footing is exposed, the spread section of the footer is notched. This helps lift the foundation. Mounted Foundation Brackets: Steel foundation brackets are attached to the foundation footings. Installing Push Piers: Steel pier sections are hydraulically driven through the bracket to reach bedrock. Weight is Transferred: The building's weight is transferred from the weak soil onto load-bearing strata. This helps stabilize, level, and lift the foundation back to normal. Foundation repairs with push piers can be done at any time of the year. Contact us today so we can schedule a free estimate. We use quality steel push piers made by Earth Contact Products, the leading manufacturer in underpinning. So you'll get the latest products on the market as well as professional service. If you need more information about our services, give us a call today. We serve residents in the Omaha, Nebraska.